Two national officers of the United Church of Christ, part of a high-level delegation of North American faith leaders, traveled to Colombia last week to provide visible support to the implementation of a peace agreement between the Colombian government and Revolutionary Armed Forces of Colombia (FARC), a rebel faction operating in the South American country. The peace accords, signed last fall, ended the world’s longest armed conflict of more than 50 years. It’s estimated 220,000 people have been killed since 1964, the vast majority of them unarmed civilians, and between 6 and 8 million have been displaced. For the last two decades, the UCC has been advocating for and working toward an end of the conflict, rooted in deep economic and social inequalities, between government forces and anti-government insurgent groups, primarily FARC. Global Ministries — a shared ministry of the Christian Church (Disciples of Christ) and the United Church of Christ — was invited to provide accompaniment in the peace process by its partner organizations, Justapaz and the Council of Evangelical Churches of Colombia (CEDECOL), and to meet with church partners and the leadership of the Colombian Tripartite Commission, which consists of the United Nations, the Colombian government and FARC. In addition to Dorhauer, the delegation included four Disciples leaders, Global Ministries staff, the Rev. Jim Moos, UCC national officer and Global Ministries co-executive, UCC Southern Conference Minister the Rev. Ed Davis and the United Church of Canada General Secretary Nora Sanders. They spent several days traveling the country, meeting with Colombia’s Presidential Counselor for Human Rights, officials of the U.S. Embassy in Bogota, and FARC commanders and community groups. 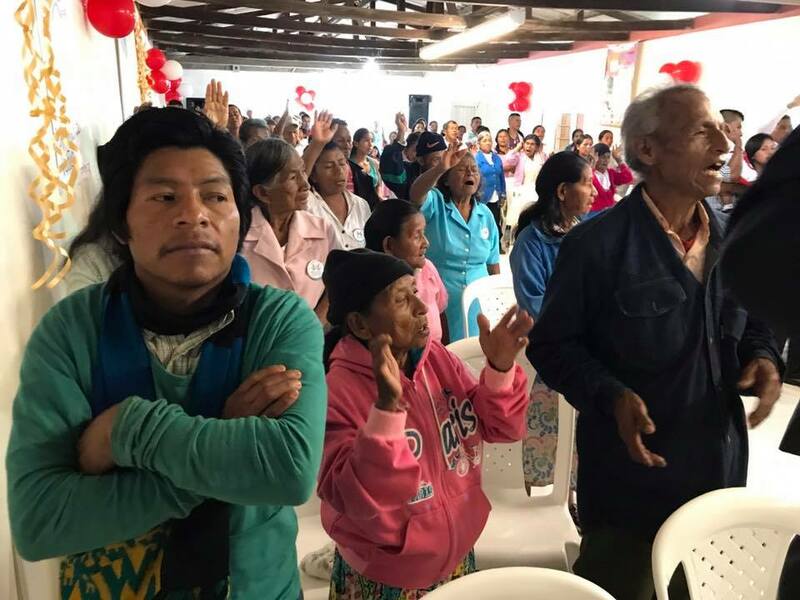 “The peace process in those communities is organized around truth and forgiveness,” said Dorhauer, “to help the people in the communities heal, to help shape the peace accord that has been written.” It involves interaction between former opposing groups and a lot of listening. As part of the process, the group spent time in Bogota, Granada, and Medellin as well as in remote villages in the Andes mountains. The Revs. Dorhauer and Moos shared moving stories of cooperation in community. Stories about people coming together. In the town of Granada, both victims and aggressors worked together on the construction of a road which will pay tribute to 19 people who had been killed by paramilitaries in that area. In the community of Santa Ana, others joined forces to create a memorial park in an area that had once been covered with land mines. “We heard story after story of women who were affected by the decades of conflict,” said Dorhauer, who scheduled the trip as part of his listening tour before General Synod. He and the other members of the delegation heard much about life under armed conflict and the work to build peace. At every point, Moos said, gratitude was expressed for their presence, and for their commitment to peace.